Slow Cooker Chili is quite possibly the best thing on the planet. Especially in the Fall and Winter, and Spring, and … well, I think I love chili anytime! I enjoy it so much because it is SO EASY to prepare, it is PACKED with flavor, and it's so hearty. These three Slow Cooker Chili recipes are very different from one another and I like them all for different reasons. One of the main reasons I like them is I can decide which recipe to make depending on what meat I happen to have on hand. If I have some chicken in the freezer, White Chicken Chili it is. If I have any kind of steak, like a sirloin, London broil, or flank steak, the Shredded Beef & Black Bean Chili is the winner. Ground beef? -The more traditional Red Bean Crockpot Chili is my choice. Perfectly seasoned, perfect texture, perfect heat – and SOOO easy. Easy as in “throw the ingredients in the crockpot and push a button” easy. This one has a couple secret ingredients. But, don't let that throw you. Just trust me. It REALLY works! 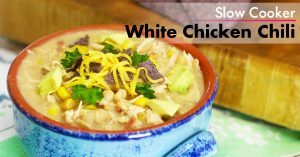 I subscribe to the belief that white chicken chili isn't technically “chili”, but that doesn't mean it can't be awesome. It's an amazing hearty soup entirely all it's own! But I'll still call it chili because everyone else does. This is also a ‘dump' recipe, so just toss everything in your crockpot and walk away. 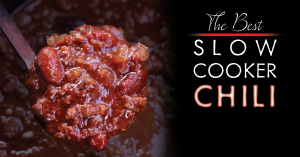 There is one final step at the end to make a thickener and it really takes this slow cooker chili recipe over the top! If you want to win the chili cook-off, this is the recipe for you! The beef has the time to slow cook so it becomes fall-apart-tender and unbelievably amazing! 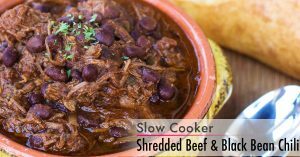 This bold, rich, and flavorful slow cooker chili recipe might be my favorite! Seared beef, onions, peppers, black beans, and other awesomeness make this one worth trying! You'll love it!